I had a chance to talk with Nancy Floyd of Nth Power, a company that invests in new energy technologies. She compared the clean energy business to the computer industry when the Macintosh came out in 1984 and voiced her frustration that Washington has failed to act on reauthorizing the renewable energy tax credit. The interview took place above the podium, which offers a pretty cool view of the arena. 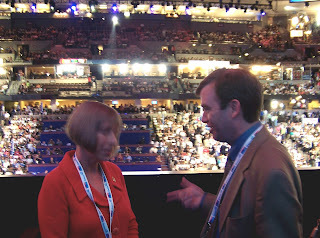 Here she is seen with Michael Eckhart of the American Council on Renewable Energy. As we were wrapping up, Kathleen Sibelius was being interviewed. I'll have more on the gridlock on the tax credit in the near future.